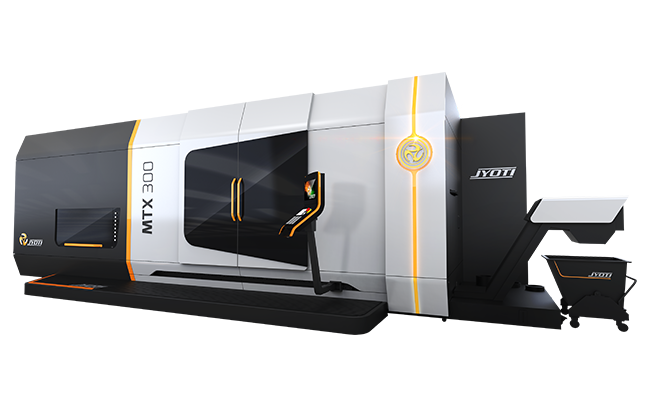 This series of state-of-art designed machine from Jyoti, caters to special needs of those complex (small or large) single piece components, demanding both 5-Axis complex precise milling + precise turn-mill operations in single machine. A complete multi-tasking possible with main electro-spindle with C-axis and secondary electro spindle with Z3-axis for turning, one milling spindle (with X1/Y/Z1 & B-axis), live tool turret (X2/X2-axis) and Y-axis with stroke of 150mm. Also equipped with large number of tool ATC and special deep boring operation upto 1mtr long and 150kg boring bar can be offer. Multitasking with uninterrupted & unmanned machining of typical applications demanding close tolerance machining for industries like aerospace, automotive, mechanical, power, oil & gas etc. High precision roller type LM with rapid of 40m/min. 6-sided complete milling and turning operations. ±150mm Y-axis for off centre machining. Powerful motorized main and sub spindle and milling spindle. 40 tool auto tool changer outside of machining area. Optional ATC available for 1000mm and 90kg long boring bar. Servo driven steady rest available. Efficient chip flow and effective chip removal. Wide door opening for better approach.